It hasn’t been a great year for growing really. A lack of sunshine and warmth meant that my berries and salad vegetables were a little pathetic this year. Two things that did, as ever, grow well were my potato and courgette plants giving me plenty of opportunity to make this lovely dish. Beware, the below recipe is rough in quantities. Scrub the potatoes and boil in salted water until almost tender. Drain and cool. Remove skins (they should come away easily) and slice into 1cm thick rounds. Heat 1/2 cm of olive oil in a large frying pan. Add the courgette rounds in batches and fry for a few minutes on each side until golden. Remove with a slotted spoon and place on kitchen roll to soak up excess oil. Once all of the courgette has been cooked, add the garlic and thyme to the oil and immediately turn off the heat. Stir until the garlic stops sizzling. In a shallow oven dish add a row of sliced potatoes. Angle them slightly so they aren’t lying flat but aren’t completely upright either. Add a row of courgettes then a row of tomatoes. Repeat until all off the veg is in the dish. Season with salt and pepper. Brush the vegetables generously with the garlicky oil then sprinkle cheese or breadcrumbs over the top. Bake in a 180 oC oven for 30 mins until the top is golden. Wonderful potatoes – they are so delicious straight out of the ground. Just had a sack of locally grown potatoes delivered and I’m definitely going to be cooking this for lunch tomorrow . It was delicious with mozarella ! Yum, yum!!! Your food and photographs are my find of the year. Oh my, this does look good Wendy. 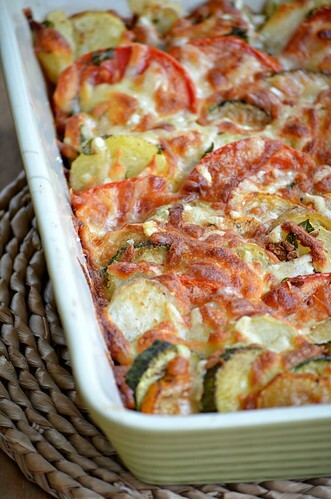 And how lovely to be able to use your own potatoes and zucchini. It does look like you’ve had a fine harvest. I’m not a huge thyme fan, but I’m thinking this might also go well with rosemary? Mmmmm, this looks SO good. May have to go on the menu this week 🙂 I’m a bit of a fail at gardening ( I like the planting and digging – I just give up on all the weeding and maintenance) so I think my veg will be coming from Mr Tescos . . .
Wow, this looks delicious. I love photographs of food. Hi Wendy, we really enjoyed this dish. 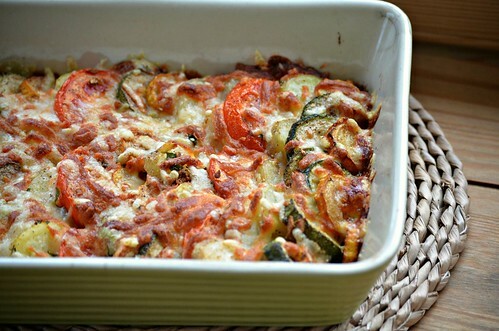 I have been looking for a tasty recipe to use up courgettes so was pleased to find this one. Still reading you regularly and loving your beautiful pics. YUM! This would be great with some sausage as a sort of breakfast for dinner. You always have some of the best ideas. Simple, hearty, and tasty! I missed this one. Glad I stumbled across it now. Gorgeous! Bookmarking it right away. 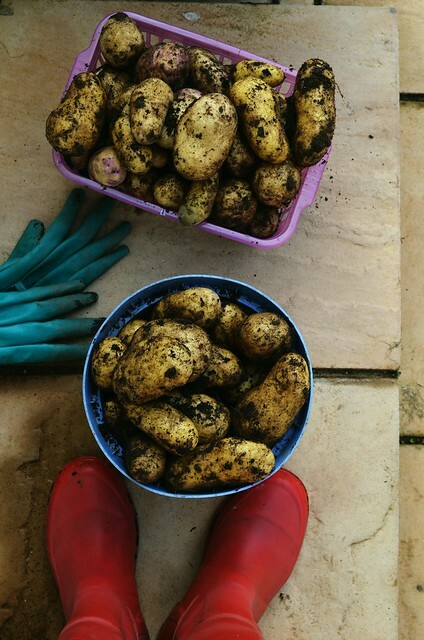 Beautiful photo of the muddy potatoes in the blue and purple containers, contrasting with your red wellies! Gratin sounds really tasty.